My babies all loved chewing on rusks but to me, the only thing worse than a slippery warm mushy rusk was a cold, soggy one covered in carpet fur. Thank goodness for the Groovy Gripper, the brainchild of two smart-thinking Australian mums. There’s no more accidental dropping of half eaten rusks with this handy device and no more throwing out half eaten food! The Groovy Gripper securely grips on to rusks and fruits sticks, leaving them to be devoured safely and free from hitting the floor. 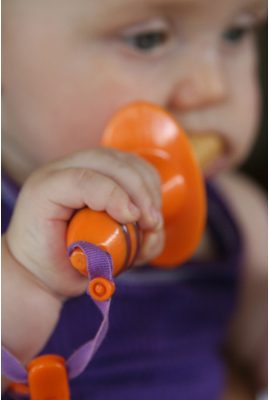 The Groovy Gripper attaches to your child’s wrist so there’s no losing it out the side of a pram or anything like that. It stays right there within their reach! For older children a separate fork and spoon attachment is available for fitting to the Groovy Gripper – great for snacks when out and about. Both items are made from high quality plastic and are safe for your dishwasher. The Groovy Gripper is $14.95 and the additional Fork and Spoon $9.95 from The Hip Infant, who deliver all over Australia.